This year's Christmas series has come to an end and for that I chose a delicious and very easy recipe, that comes from a book I adore . These cookies are wonderful, super tasty and quick to prepare, and I think they would make a great last minute Christmas gift. I hope you've enjoyed the holiday recipes I've posted and I wish you all a Merry Christmas! Preheat oven to 180°C/350°F. Line two baking sheets with baking paper. In a medium bowl, whisk to combine the flour, nutmeg, cinnamon, salt, baking soda, allspice, cloves and pepper. In the large bowl of an electric mixer, beat together the butter, brown sugar and molasses until creamy and lighter in color. Beat in the egg and vanilla. Scrape the sides of the bowl. Stir in the dry ingredients. Using 1 tablespoon for each cookie, roll dough into balls and place them 5cm (2in) apart onto prepared sheets. Bake until golden brown on the bottom and just fir to touch, about 14 minutes. 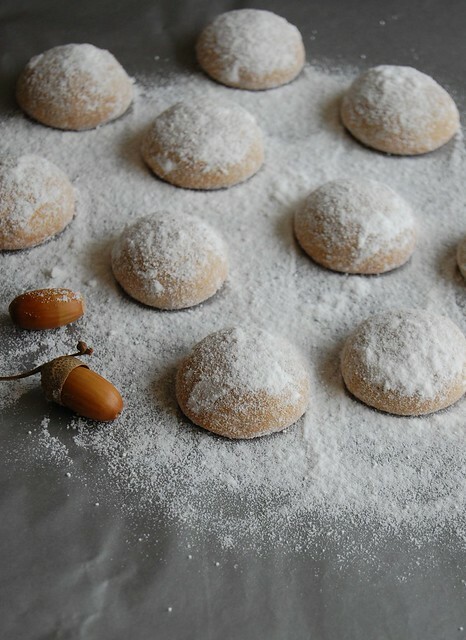 Cool on the sheets over a wire rack for 5 minutes, then carefully coat warm cookies with the icing sugar. Transfer to the rack and cool completely. Lovely cookies, Merry Christmas to you! Merry Xmas Patricia, thank you for your lovely blog and for sharing all those gorgeous recipes!